Today I visited the used book shop near my home, which has a large and deep (if disorganized and perhaps over-priced) sf section. There I found two books by Ian McDonald, fulfilling my wish to have (and eventually read) more stuff by him (see previous entry). 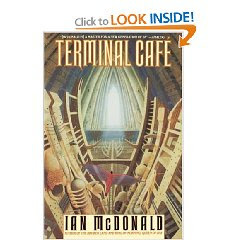 The novels are Terminal Cafe and Evolution's Shore, which is evidently the first of several novels known collectively as the "Chaga Saga."